¡Tu mensaje de bienvenida, twitter o publicidad aquí! First and foremost of all that has been written or said it is essential to draw attention to the fact that the Anti-Sikh Riots of 1984 was a catastrophic aberration, an earthquake that shook, mangled and tortured thousands of people, not only in India but nearly the whole world. The Riots of 1984 will go down in history as the most shameful, disgraceful and most dishonorable event that happened in a tolerance oriented, peace-loving and democratic country. The perpetrators of the atrocities that occurred in 1984 must be punished, irrespective of the position and power they hold, for they are the people who have wounded India with their innate selfishness and hatred for their fellow countrymen; and if found guilty of this crime against humanity, they must be given the utmost penalty by the law of India. For the past twenty-odd years I have been living under a kind of eclipse, which has never moved away. This darkness that has come over me has over-shadowed my work for the Sikh community which has remained unseen. It is on record that I am the one person, who, inspite of the huge propaganda against me, has ceaselessly worked for the rehabilitation of the widows, the families and the Gurudwaras who had been affected by the riots. I can proudly say that I have slowly and steadily brought them back to shape, giving jobs to the children of victimized widows, and gave them protection through Police Stations. This not verbal – all these actions are on record and can be proved. Even today, I openly challenge anyone, be they even a Sikh gentleman/lady to come forward with proofs to show that I am wrong and am a culprit, I would like to emphatically say and acknowledge my guilt, and receive their judgement with sincerity and take the biggest penalty that law of India can offer. The Nanavati Commission received/collected 3,752 affidavits. It should be noted that nearly 3,083 affidavits were against the Sikhs. Even before the Nanavati Commission, the BJP Government which was in power in Delhi at that time, withdrew quite a good number of affidavits filed against a number of their activists. The above is a press item published in the Hindustan times of the 3rd February, 2002, which shows you the extent of the powers that the opposition political parties have, and their capacity to harm innocent people. 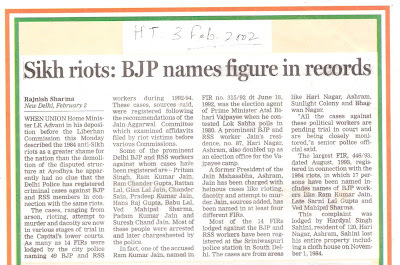 BJP leaders, like those mentioned above, who claimed to be fighting for the victims of the ‘84 Riots, did not write in their books about me – either directly or indirectly – or even referred about me! They, however, took the advantages of cheap publicity, with the help of the Press and the Media to malign me, and spoil my political career, by character assassination and mischievous propaganda. Armed with these propaganda weapons, they cut my seat from Parliament, made me give up my Ministry, and also my Parliamentary seat. All this was done to ruin me, without a single iota of proof. In spite of the fact that, Justice Nanavati had said in a recorded talk with Shri Rajdeep Sardesai, Chairman of IBN News Channel about my role in the 1984 Riots he never said that there was any Substantial Evidence against me. However, if you watch the video, you can find out for yourselves what the Media can do and that it can create anything out of nothing! And yet the IBN new channel starts spreading rumours that the Justice Nanavati Commission found “Substantial Evidence against me! It seems that IBN is more interested in increasing the TRP (Television Rating Points)of their news rather than in giving the true news to the public. I have a question to ask the media: Is it human to destroy someone’s hard-earned reputation just to increase the TRP of a channel? Why am I being Punished and for what reason? I hope that you go through the documentation in this website and arrive at the truth about me. There are many articles and books written by lawyers, historians, and many others about the ’84 Riots. Many different political leaders have also written on this subject, but not one of them has mentioned my name with authentic, documentary of physical proofs by truthful witness witnesses. There is a “Black Book” called which very authentically described the ’84 riots. This was written jointly by PUCL (People's Union for Civil Liberties) and PUDR (People's Union for Democratic Rights); where they had authentically stated that I barged into the Office of the Commissioner of Police inbetween a press conference and I accused the Police for hampering my relief work. A very unjust, mischievous, fraudulent twist was given to this, and a concocted story that I had gone to the Police Commissioner with a completely different motive. This has hurt me, my life, my family, and my healing work. It is on record that I was involved in the relief work and the Police Commissioner was not co-operating with me. It was normal under those circumstances for anyone to barge inbetween a press conference or anything. Sometimes somethings becomes more important then anything else. I agree that a press conference plays a major role in the development of the country but during emergency, it is normal that the importance may shift to something else. Unfortunately, my "relief" work was related to "release" work. It is very illogical to make such kind of interpretation. I don't know why people started talking about the statement given against me by the journalist. People started talking about me for pressurizing the Police for release work. On the other hand, I was blaming the Police for not co-operating in my relief work. People started believing what a single person out of the 15 member press conference said about me, even though, the report itself tells a different story. On page 12 of the black book, details about the leaders for pressurizing policeman, my name is not mentioned there. It is very ridiculous that people are connecting me with the 1984 riots just because a single person said something against me? I would like to request you to go through the PUCL and PUDR report once again. Read page 12 carefully where the report speaks about the leaders pressurizing police. Can anyone find my name here? Is it not ridiculous that people are not talking about the actual report but are blaming me just because one person misinterpreted my statement? Friends, I strongly believe in God, I believe in the Sri Guru Granth Sahabji. I belong to a Sikh family. My late parents, my brothers and sister, all believe in the Sikh religion, and all of us worship in Gurudwaras nearest to our homes.We teach our children to respect and adore God and to treat everyone of the brotherhood of all in the fatherhood of God My family roots are from a small town called Gujranwala, in undivided India, and now in Pakistan. Our family migrated to Delhi during the time of Partition, I became fatherless during the long flight from Gujranwala to Delhi. He was murdered by Pakistani fanatics. I was only four years old. The nightmares of those days still pursue me. My belief in God, and the blessings of the Sat Guru ji Maharaj Nanak Sahab ji, and the Sikh Gurus have protected me from harm. My parents were deeply religious. They, especially my mother, taught us to respect life, to love one another, and to treat all equally as we are all brothers and sisters and equal in the eyes of God. How can I, with such a background, with such kind of training ever think of taking part in the Anti-Sikh riots? With all humility, I appeal to you all, to consider these facts. You are the best judges! Believe me, when I say that certain elements, who desire to hurt and annihilate me have concocted lies, and have used the Media for political expediency. I request you to go through all the material that I have put together so that you can see for yourselves how a conspiracy against me has be concocted. The Akali Party and the BJP got together when the Justice Nanavati Commission Report was submitted in Parliament by the Minister for Home Affairs of the Government of India. They made a lot of noise and said a lot of bad things, not only about me, but about respected people like the present Prime Minister, Dr. Man Mohan Singh and the Congress Party itself. These people who today are using abusive and bad language have definitely forgotten that it was the Congress Party and its very senior members like Mahatma Gandhi, Jawahar Lal Nehru and many others in the Congress Party were the people who brought the British Empire to its knees, and gave India its much deserved Independence. left for me. I got up and submitted my resignation and said that I would not like to be a part of a House that spoke in this manner, and that I will not take any part in the Government until my name was cleared. You will agree that there was nothing else that could be done. I would like to tell you all, that inspite of this fact, the Cabinet gave me a ‘clean chit’. Because of political pressures, the case was referred to the CBI with instructions to investigate if the two affidavits lodged by Sardar Jasbir Singh and Sardar Surender Singh were true or false. 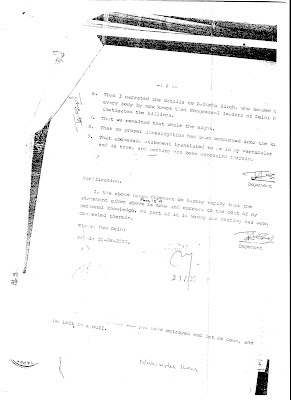 Acting on this basis, the CBI submitted the 1984 Riots case Report before the Hon. Court of Mr. Sanjeev Jain, u/s 173 for clearance on 29/09/07; and the Hon. Court placed the case for hearing on 4th October, 2007. Jasbir Singh, son of Sardar Sutta Singh; and the other made by Sardar Surender Singh, son of Sardar Ajit Singh. The CBI has taken both the affidavits into consideration. (a) That, four days after Mrs. Gandhi's assassination, on the 3rd November, 1984 at 11.00 p.m. he saw Mr. Jagdish Tytler near the gate of the T.B.Hospital, rebuking a group of people saying that his "instructions had not been faithfully carried out. There had been only a nominal killing in the constituency compared to other places, as I had promised." 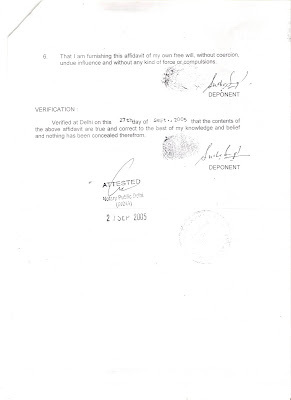 This is totally false and fabricated because the whole of Delhi was under curfew, with "shoot at sight" orders, and the whole area of Delhi had been taken under the custody of the Armed Foreces in the late afternoon of 2/11/1984, as per the letter of the Ministry of Home Affairs, taken under RTI Act. As the whole of Delhi was under curfew not a single person could move anywhere, not even within any street; and the question does not arise of a group of people coming together to listen to a talk by Mr. Jagdish Tytler before the gate of the T.B.Hospital. This is a false and fabricated lie. (b) S. Jasbir Singh also states that he stayed in the house of S. Sucha Singh, and that he went and told him, in detail, what he saw and heard. This is also false and fabricated. 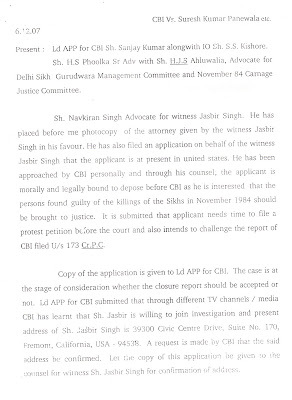 S. Sucha Singh has also submitted his affidavit to the CBI, in which S.Sucha Singh states that he does not know S.Jasbir Singh, that he had never seen him, nor ever heard his name throughout his life. 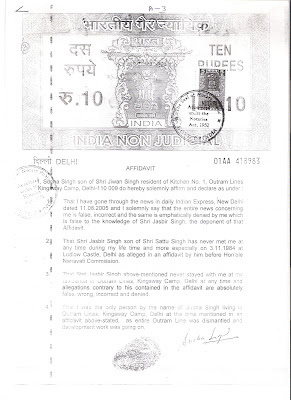 His affidavit clearly states that S.Jasbir Singh never stayed in S.Sucha Singh's house. To confirm his statement, S.Sucha Singh has also issued his statement to the press as well. 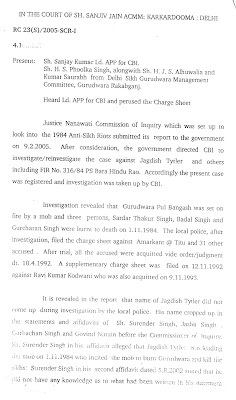 Keeping in view the perspectives of S.Sucha Singh's affidavit and statement combined with the curfew on that day, the statement that S.Jasbir Singh had heard Shri Jagdish Tytler instigating the people collected at the gate of the T.B. Hospital to kill more Sikhs fails. No incident of arson, burning or killings was reported in any area including Outram Lines and Kingsway Camp or Delhi, at this particular time, either before or after the Riots. The CBI investinged the above affidavit and submitted their report in which the CBI found nothing against Mr. Jagdish Tytler and requested the Hon. Court for the closure of the case u/s 173 IPC and once again gave a "clean chit" to Mr. Jagdish Tytler . The Hon. Court put up the case for hearing on 4/10/2007. On 4/10/2007. the case was placed before the Hon. 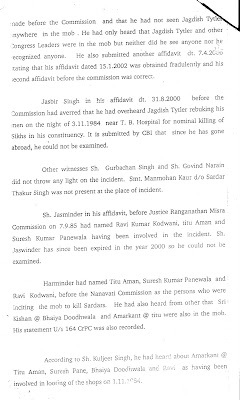 Court and as per the Court order of 4/10/2007, it was revealed in the report that the name of Mr. Jagdish Tytler did not come up during investigation by the local police. 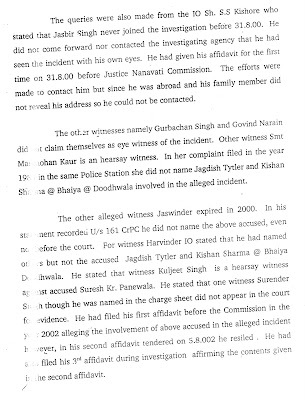 His name cropped up in the statement and affidavit of S. Jasbir Singh before the Commissioner of Inquiry, alleging that Jagdish Tytler was inciting some people to kill the Sikhs. 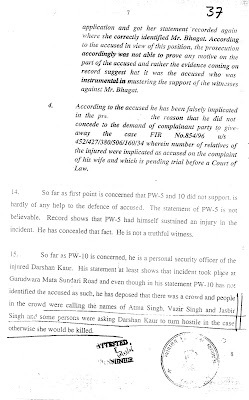 S. Jasbir Singh in his affidavit dt. 31/08/2000 before the Commission had averred that he had overheard Jagdish Tytler rebuking his men on the night of 3/11/1984, near the T.B. Hospital for nominal killing of Sikhs in his constituency. It was submitted by CBI that since he had gone abroad, he could not be examined. The Hon. 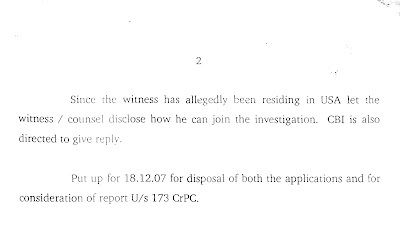 Court also stated that the CBI submitted, during the investigation, that no evidence came qua the involvement of Jagdish Tytler; but before considering the closure report the Hon. 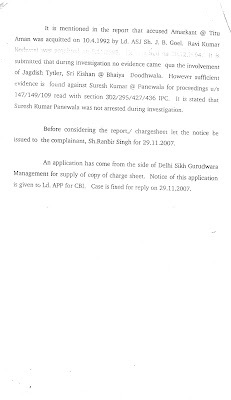 Court directed to call complainant Shri Ranbir Singh of the Delhi Police on the next hearing, i.e: 20/11/2007. Mr. H.S. Phulka, Mr. H.J.S. 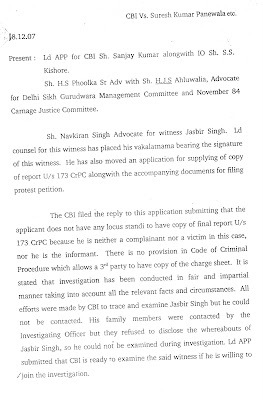 Ahluwalia and Mr. Kumar Saurabh from the Delhi Sikh Gurudwara Managing Committee submitted an application for the supply of the charge sheet given by the CBI u/s 173 IPC for the closure of the case. 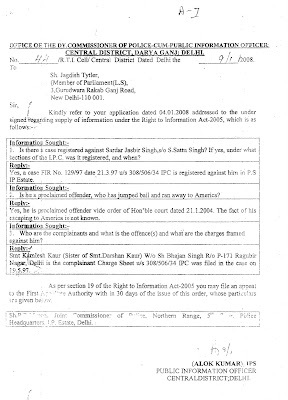 On 29/11/2007, Inspector Ranbir Singh who was an informant in the case, was present in the Hon. Court and he stated that he was present on the spot at the time of the alleged incident and he did not see Mr. Jagdish Tytler on the spot, or near the spot, or anywhere near the spot instigating the mob committing the alleged offence. He stated that he was the person who first informed the police and on his statement the case was registered. 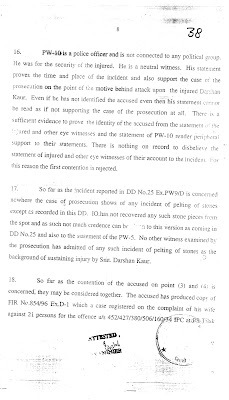 It is stated in the Court Order that investigation has been conducted taking into account all the angles including conspiracy, the efforts were made to join the witnesses. Only one witness S. Jasbir Singh could not be contacted since he was out of India and his family members refused to give his whereabouts. Mr. H.S. Phulka, advocate, promised the Hon. 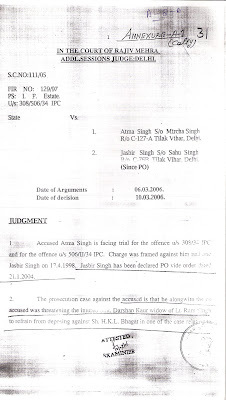 Court to submit the address of S. Jasbir Singh by 1/12/2007. The case was put up for the next hearing on 6/12/2007 for the consideration of closure report. On 6/12/2007, Mr. Nav Kiran Singh appeared in the Court as Counsel of S. Jasbir Singh and filed an application against the “clean chit” given to Mr. Jagidish Tytler by the CBI in the 1984 Riots. The Counsel for S. Jasbir Singh filed a protest petition before the Hon. Court stating that his client was an “Informant” and not a witness, which again is an absolute lie. 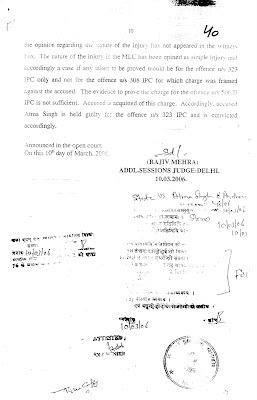 Regarding S. Jasbir Singh’s address, it has been approved by the Court and mentioned in the Court Order also. The case was put up for further hearing on 18/12/2007. On 18/12/2007, the Hon. 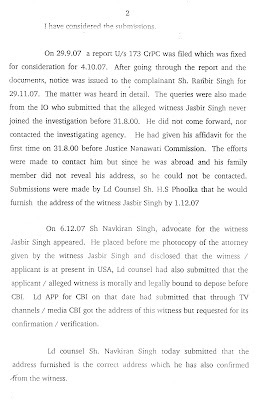 Court instructed the CBI to further investigate S. Jasbir Singh’s allegations against Mr. Tytler and submit the report by 16//1/2008. The CBI made their best efforts to contact S. Jasbir Singh and his family members to find out his whereabouts, but were unable to do so but he appeared in news channels and gave false statements and tried to mislead by stating that he feared danger to his life. 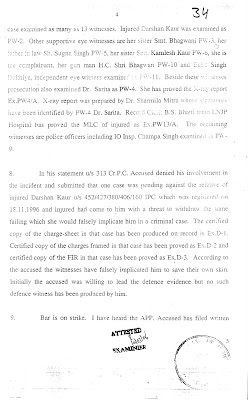 These statements are highly fictitious, false and fraudulent because S. Jasbir Singh has been declared as a “Proclaimed Offender”(PO) and there was an open arrest warrant against him by the Order of the Addl. Sessions Judge, Shri Rajiv Mehra in the year 2004 and this is the real reason for his not coming back to India to give his statement to the CBI. It would be pertinent to draw attention to the fact that S. Jasbir Singh was involved in the above case for the reason of attacking and threatening, beating and mal-treating the victims of the 1984 riots. Smt. Darshan Kaur and Smt. 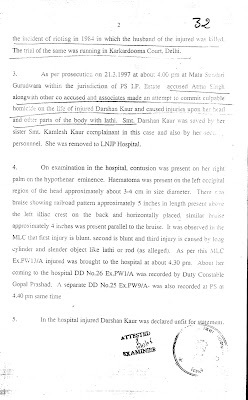 Kamlesh Kaur were physically prevented from going to Court and was also offered Rs. 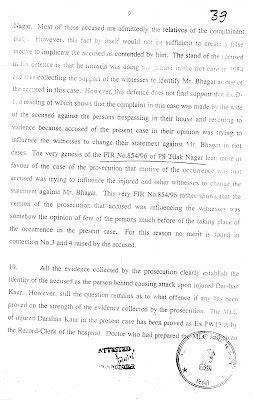 25 Lakhs for not giving witness against those who were involved in the 1984 Riots. 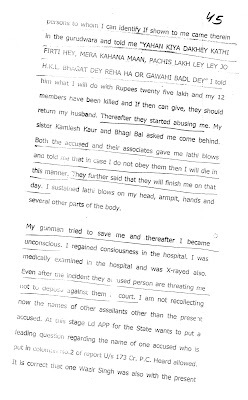 Sardar Surender Singh, son of Sardar Ajit Singh, submitted an affidavit, written in English, stating that he had seen me instigating the mob for killing Sikhs near the Gurudwara Pul Bangash. However, Sardar Surender Singh later submitted an other affidavit, before the Justice Nanavati Commission, denying the first affidavit, based on he fact that he did not know English at all, and that he could neither, read, write of speak this language. He also added that the English affidavit was not rightly read out to him, and therefore, he had written another affidavit this time in Gurmukhi (his mother tongue in which he was capable of speaking, reading and writing. He categorically stated in the second affidavit (the Gurmukhi affidavit) that he had not seen Mr. Tytler (me) at or near the Gurudwara Pul Bangash, on that day and time. Sardar Surender Singh also stated that he had signed the first affidavit in the hope of getting compensation for the losses sustained due to the burning of the Gurudwara at Pul Bangash. The CBI investigated both the affidavits of Sardar Surender Singh thoroughly and reached the conclusion that the second affidavit, written in Gurmukhi was correct and that I was not with the mob attacking the Gurudwara on that day. 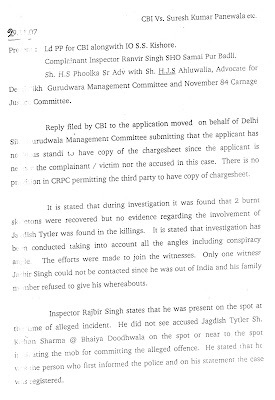 Regarding the affidavit submitted by Sardar Jasbir Singh, the CBI in spite of their best efforts were unable to trace him. His family members could not give his whereabouts, nor could they find out anything against me. Sardar Jasbir Singh has stated in his affidavit that he had seen me on 3/11/1984 at about 11.30 p.m., near the gate of the T.B. Hospital, Kingsway Camp, Delhi. He has also stated that he stayed that night in the home of Sardar Sucha Singh in Outram Lines, Kingsway Camp, Delhi. Both the statements in his affidavit have been found to be false and fabricated. 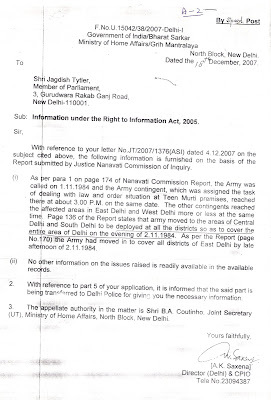 You may be aware that Delhi was under Army curfew, with stringent orders to “shoot at sight” orders. The statement that he went for a walk after supper from Sardar Sucha Singh’s house to come to the gate of the T.B. Hospital is impossible under curfew conditions. The second point in his statement that he saw me haranguing with a group of persons who had assembled at the gate of the hospital is false and purely imaginative. It is not at all possible that I could call a group of people and have an open air meeting at the gate of a hospital (public place) during the heavy curfew, and that too breaking the curfew laws by holding this meeting is beyond all comprehension. There is also a small mistake that has crept into the affidavit: He calls me a ‘Minister’! I was only a young and new Member of Parliament, and it was Rajiv Gandhi became the Prime Minister, was I given a berth in his Cabinet. Evidently, the affidavit was written much later, perhaps a few days before its submission to the Justice Nanavati Commission! Again, Sardar Sucha Singh (who according to Sardar Jasbir Singh) had hosted him on 03/11/1984), when he saw his name in the newspapers, and also on a certain TV Channel stating that he had hosted Sardar Jasbir Singh, immediately released a statement to the effect that he had not hosted Sardar Jasbir Singh, that he had never seen him in his lifetime, that he knows no one named Sardar Jasbir Singh. 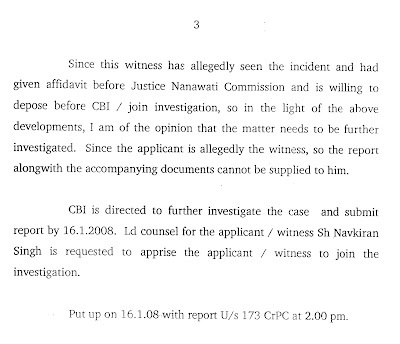 He then had an affidavit written and gave this to the CBI for their information. The Counsel for Sardar Jasbir Singh filed a protest petition before the Hon. 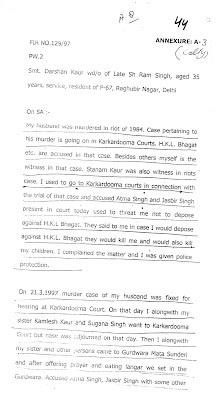 Court stating that his client, Sardar Jasbir Singh, was an Informant (not a witness). The Hon. 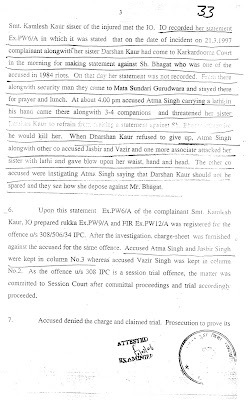 Court, by its Order dated 06/12/2007 found the hand-written address of Sardar Jasbir Singh and as given by Sardar Jasbir Singh’s Counsel. 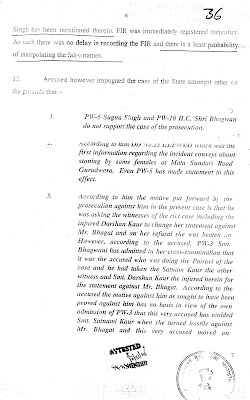 A certain TV Channel claimed that Sardar Surender Singh alleged against me. Sardar Surender Singh who saw this on the IBN-CNN Channel was annoyed at the wrong and mischievous statement, and he wrote to the Chairman of the Channel in Gurmukhi. 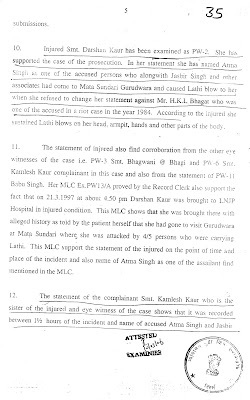 Sardar Surender singh again confirmed his Gurmukhi affidavit, in which he had stated positively that he had not seem me anywhere near the scene on that day. Sardar Surender Singh sent a lawyer’s notice to the Chairman of the Channel for releasing false and edited files on the Channel. 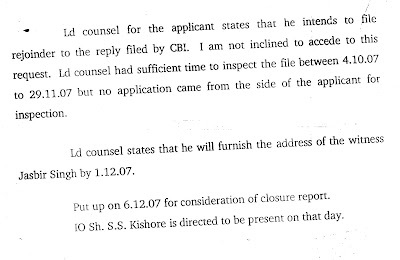 He also wrote to the Director of the CBI through his Advocate regarding this issue. 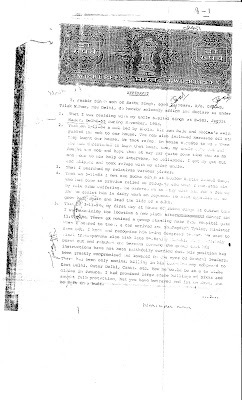 To confirm the above affidavits, Sardar Kundan Singh, President of the Gurudwara Singh Sabha and the then Vice President of the Gurudwara Singh Sabha in 1984 and Sardar Kuljeet Singh Duggal, Secretary of the Gurudwara Singh Sabha, who was the then Executive Member of the Gurudwara Singh Sabha in 1984 have both written to the Director of IBN-CNN bringing attention to the truth and pointing out the lies. Over and above all this, Sardar Surender Singh has given a statement to a reporter in which he has stated the truth in his conversation with the reporter. This video tape can give you a clearer vision of the truth which is being polluted.